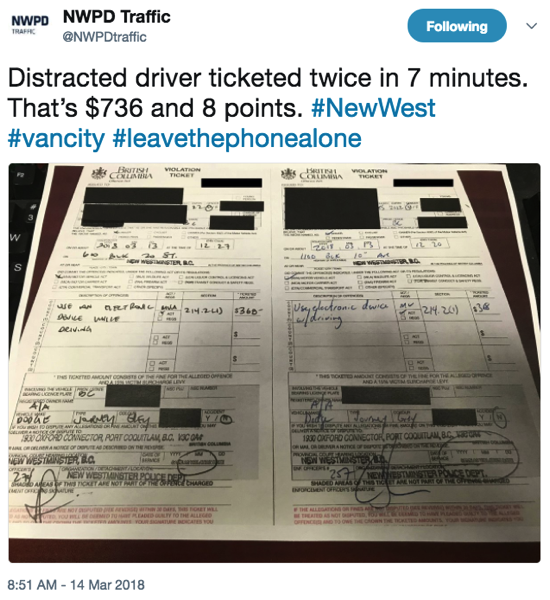 The New Westminster Police Department in the BC Lower Mainland has been clamping down on distracted drivers this week, and recently shared an image of one driver getting two tickets within seven minutes. According to the BC Motor Vehicle Act, a first infraction for distracted driving also comes with a $175 ICBC Driver Penalty Point premium, so that’s $543 for a first-time ticket. For example, drivers with two or more convictions for the use of electronics devices while driving over a three-year period could pay as much as $2,000 in penalties – an increase of $740 – in addition to their regular vehicle insurance premium. Last week, the NWPD handed out 116 distracted driving tickets at the same location in four days, near the Queensborough bridge. It seems drivers just aren’t getting the message to keep their hands off their smartphones while driving.